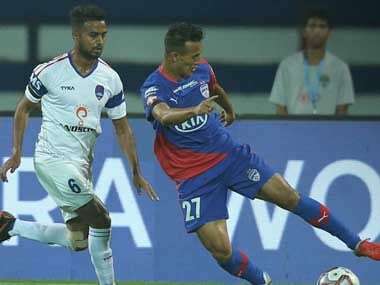 Bengaluru: A late strike from Udanta Singh helped Bengaluru FC beat Delhi Dynamos by a solitary goal and top the Indian Super League table on Monday. Bengaluru FC are now on the top of the ISL table with 19 points from seven games, while it seems all but over for Delhi Dynamos as they remain rooted at the bottom without registering a win from nine games. Bengaluru FC started with four foreigners in the absence of the injured Miku and suspended Dimas Delgado. Erik Paartalu recovered in time to be named on the bench. Delhi completely dominated the first half but failed to find the goal. Bengaluru goalkeeper Gurpreet Sandhu was called into action in the 15th minute when he parried a shot from Adria Carmona after Lallianzuala Chhangte foxed Rino Anto to set up the chance. In the 27th minute, Nandhakumar had a fine run down the right after some good build-up play. However, the final pass to Andrija Kaluderovic saw the striker slam the shot wide. Just after the half-hour mark, Chhangte broke the offside trap and was in a one-on-one situation. However, Gurpreet came off his line and blocked the effort. Rino Anto once again played Delhi onside and this time the ball fell for Nandhakumar whose shot was deflected for a corner by Juanan. The Blues had a great chance to score in the 70th minute when Udanta took advantage of a confusion in the Delhi defence to play Xisco Hernandez through on goal with a good lob. But the Spaniard's first-time shot was straight at Albino. Three minutes later, Delhi's finishing woes were on show as Kaluderovic headed over from close range after getting on the end of a corner from Rene Mihelic.